Binary Scam Alerts is posting an immediate SCAM notification in regards to the Free Money Guaranteed Software, App, and Autotrader as well as Robert Anderson the fake actor and Walter Green emulator. This obvious sham is almost a complete replica of the Free Money System AKA the Millionaire’s Blueprint. Our staff has received about 10 complaints about this new system during the past hour, and all of them have to do with aggressive Email marketing SPAM designed to illegally solicit innocent day traders into a confirmed binary options investment SCAM. After conducting a meticulous investigation and review of the facts, we will present clear and unequivocal evidence of what we believe to be a blatant attempt to mislead, deceive, defraud, and victimize customers that simply want to profit trading binary options online. 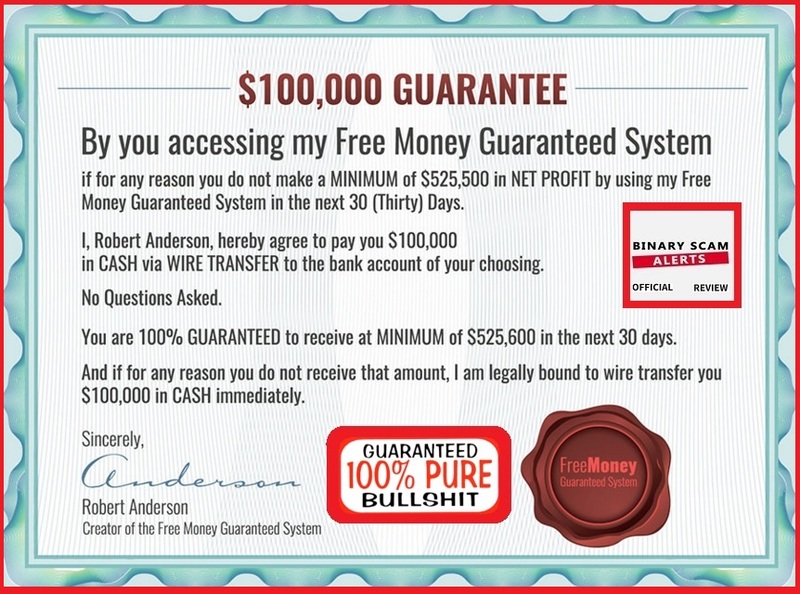 As you can see below Free Money Guaranteed is a variant of Walter Green and the Free Money System AKA Millionaire’s Blueprint. They took the same sales pitch and this time instead of framing the scene to be in an office environment, they took this nobody, put him in a fancy rental car (Rolls Royce I believe) and had him machine gun through a crafty script designed to mislead you and get you to register and open a new trading account with one of their recommended brokers. Chances are if you have been exposed to this video, it would have been either through email messages or alternatively promoted openly in any one of the media outlets while browsing articles related to life hacks, money making opportunities, lifestyle, gambling, work from home, or online trading. This is a classic retake on the Free Money System, and it’s packed full fake testimonials, inflated bank accounts, lies, deception, misdirection, and deceit. The most troubling aspect of this fraudulent app is the so called promise of the $100,000 Guarantee. This ripoff artist explicitly states that “if for any reason you do not make a minimum of $525,500 in Net Profit by using my Free Money Guaranteed System in the next 30 (thirty) days” you will get 100K transferred to your bank account “No questions Asked”. They even photo-shopped this fake guarantee (see image below) and tried to make it look official, but this is very fallacious and merely amplifies how cheap and low this con-job really is. As if you needed further evidence, you can clearly see the car is a rental and on consignment through mcarcompany located at 1925 SE Powell Blvd Portland Oregon 97202. Feel free to check them out, they have really cool cars. The story goes on to mention how they were reviewed in The guardian, Bloomberg News, and the Financial Times, but we found no mention of this guaranteed system in any of these news outlets. I did rather enjoy the part where he is inviting the blond bimbo to “Hawaii For the Anniversary”, it really ads a nice touch to it but it’s a scam none-the-less. So if you are thinking about buying into this shameful piece of trash, don’t be surprised if you end up losing your initial investment in the blink of an eye, because this system is not only rigged, it is integrated to unregulated offshore brokers that ethical business practices don’t concern them in the least bit and they will bleed you dry and leave you hanging in the most shameful and demeaning manner. 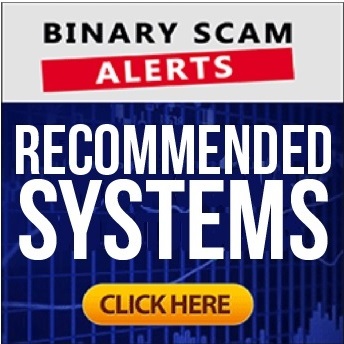 Binary Scam Alerts has gone to extreme measures and put together a rigorous credibility test that not only covers performance and accuracy levels, but also transparency, customer service, reliability, and ease- of-use. This fake app scores a big fat zero on all of the above, so there is no room for misinterpretation or lack of clarity, this is a 100% verified SCAM and should be treated as such. So if you are contemplating signing up for this trash piece of code, don’t say we didn’t warn you. You will not achieve a ~90% ITM ratio, and all the candle sticks analysis, bolinger bands, and scalping techniques won’t help you even if you mix strategies at the advise of a “senior broker”. In other words, you need to shift your thought process from making money trading binary options online to how to exit this vile scheme with whatever is left of your money. Sure it is, but you must register and fund a trading account with a recommended broker, to qualify for the crummy app and that will cost you at least $250. We got new stuff coming out every day but we have set forth stringent measures to make sure our members get the best and most accurate systems available online today. The Free Money Guaranteed Software, App, and Autotrader as well as Robert Anderson is a confirmed binary options investment scam. It is particularly dangerous and vile due to its uncanny ability to deceive, victimize, and bait innocent day traders into funding trading accounts through a variety of extremely effective false advertising tactics. There is not one thing which is honest, sincere, or genuine about this hideous system besides the intent of the people behind it to elegantly fleece your wallet and send you on your merry way. We advise all our members and viewers to avoid it like the plague and seek alternative means of investing. As always, should you need more detailed information make sure to contact us through our Facebook group or YouTube Channel.